The inspiration for modeling projects, and in this case, an article to describe them, can come from many sources. 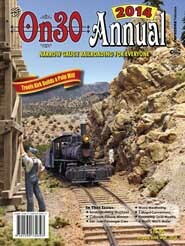 In this instance, the nudge came from a simple post on the Yahoo Maine Narrow Gauge Modelers site. 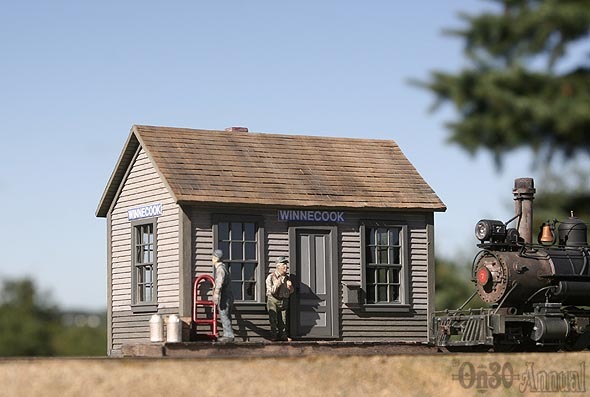 The message in question, sent by Joey Kelley, with whom I had worked on the Belfast & Moosehead Lake Railroad here in Maine, related to a small station called Winnecook. At this location, about thirty miles east of Belfast, there was a long passing siding and a station that a September 1944 timetable showed as a flagstop. The building was a simple clapboard structure and was long gone by the time I started as a conductor on the B&ML in the 1990’s; I made a point of announcing its former presence each time we passed. As I believe good modeling dictates, I spent a fair amount of time and effort in discovering some information on the prototype. The building’s construction date never did surface, and there are several opinions about when it was taken down, most centering on the mid to late 1960’s. Working with the Brooks (Maine) Historical Society President Joe Feero, and his extensive collection of B&ML documentation, we were able to determine that the freight station on the site, which measured 12×16 feet, was retired in 1946 and sold to an “outside party” for $10. A loading platform at Winnecook was removed in 1947, and the actual station platform measured 9×100’ and apparently was supported by six inch timbers. Plans for the station, in ¼” scale no less, were published in volume 7 of Short and Narrow Rails in 1982, and for some reason, I had acquired and kept a copy of that issue. I had often contemplated building the structure, first for my HOn3 layout and more recently in O scale, after I made the switch to On30. Joey’s post was the kick that I needed. Ultimately, I decided to build two versions of the station. One would be a sheet and strip wood model, well detailed on the exterior. I decided to build the second model, using styrene and to laminate various sheets and scribings together to create an interior detailed according to information on the plan. I wanted to include drawings of the structure but needed to avoid any copyright issues. Thus, I created line drawings of the station, using the dimensions from the plan but re-sizing the window and door openings to accommodate Grandt Line castings. The castings that I chose to use are close to the original features, but other pieces could easily be substituted should modelers choose to do so. Let’s get started on construction. You’ll need to free Acrobat Reader software to open and print these downloadable PDF’s. Enjoy and send us pictures of your completed model! Order the 2014 On30 Annual today!